Ever heard of Edna Lewis or Scott Peacock? The extra condensed version: Edna Lewis was an African -American woman, the daughter of an emancipated slave, who made her way to NYC and eventually became a very well-known chef. She wrote several cookbooks. Later in her life, she mentored a young gay Southern man, who ended up cooking and co-authoring cookbooks with her. When she reached the end of her life, they lived together and Mr. Peacock became her caretaker. The NY Times did a story about it that was quite touching. There really is a point to this story. The point is, that when I was sitting in a doctor’s office a week or so ago, I was flipping through a Woman’s Day or Better Home and Gardens or one of those “ladies'” magazines. A picture of Scott Peacock caught my eye. Is he writing for ladies’ magazines now? Well, I have no idea if it’s a regular writing gig for him or what, but sure enough, there was a recipe for an oven-barbequed chicken recipe that just looked heavenly. Particularly when you live in rain-drenched, gray and cloudy skyed Sacramento in the middle of winter. Even more when the groundhog decided we’d have 6 more weeks of this business. 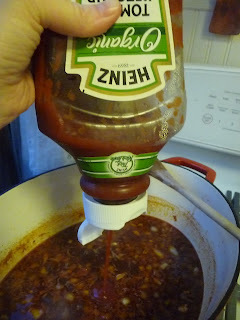 I think you could make any chicken with this technique, using any sauce of your choosing. It’s a good ‘un! The actual recipe called for whole, cut-up chickens. 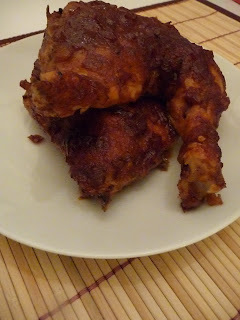 I used leg quarters, with is better bbq chicken anyway. 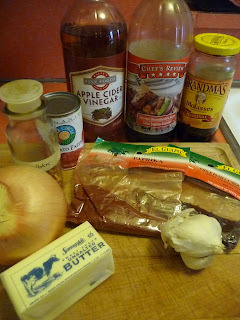 And really, for braising, it’s the way to go. I just bought the big package at the store. Conveniently, they were on sale. You could just use thighs or drumsticks too, whatever floats your boat. Anyway, pat them dry and season them with salt and pepper. 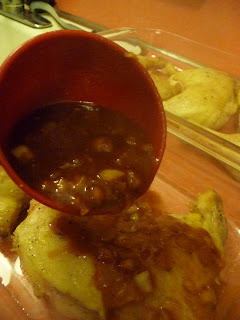 While the chicken parts are just hanging out in the salt and pepper, you need to make the bbq sauce. No bottled stuff allowed. All that stuff has liquid smoke in it and that’s just gross. Start by sauteing onion in butter. Butter and onions are always a good place to start, don’t you agree? 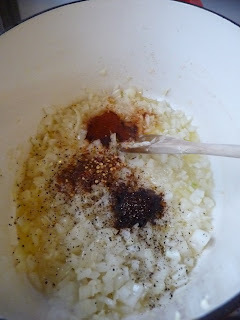 Alright, when those are softened, add in the garlic and the spices–chili, paprika, red pepper flakes and black pepper. 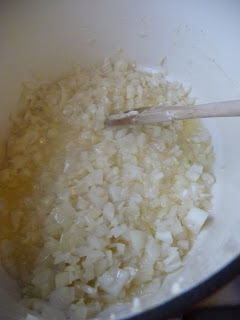 Stir through and let cook for a minutes or two, but stir it so that the garlic doesn’t burn. Burned garlic is bitter and nasty. 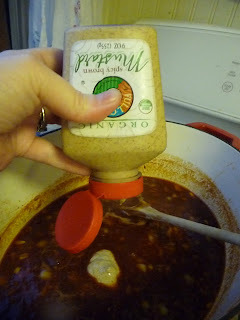 Now you want to add the liquid–apple cider vinegar, Worcestershire and water. Stir in some brown sugar. Take off the top one, then use your thumb to push the other end, kind of like a push-up. Remember push-ups? Do they even make those any more? And if they do, are the Flintstones still on them? And squeeze in some mustard–doesn’t matter what kind. Stir it up and bring to a boil. Lower the heat and let it simmer on low till you need it. On to the chicken! Heat up about 1/4″ of oil in a cast iron skillet. When it’s hot, put the chicken in skin-side down and let it get browned quickly. You don’t need the chicken to cook through—you’re just developing flavor with the browning. After searing, place chicken pieces in baking dishes. Add about a Tbsp of water in each dish. 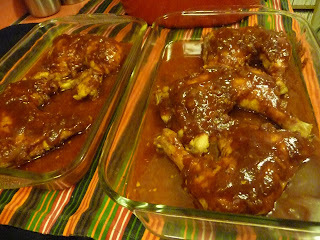 Spoon some of the sauce over the tops of each chicken piece. 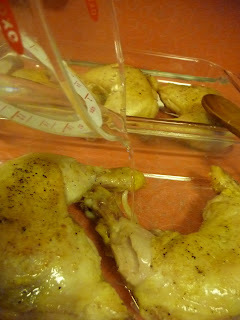 When chicken is covered, place a sheet of parchment over the chicken parts. I folded mine so it would fit my oddly shaped Pyrex. 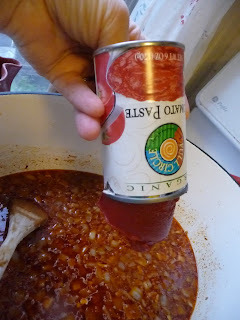 After that, cover it tightly with aluminum foil. No gaps! Bake it in a 325* oven for about an hour. 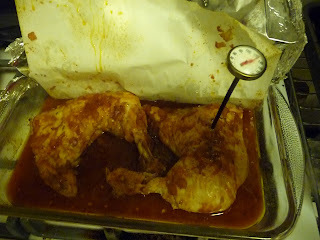 Take the chicken’s temperature to ensure that it is done (160*). Next you’ll want to glaze it! Raise oven temperature to 450*. 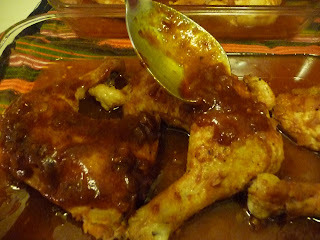 Spoon or brush more sauce over the chicken pieces and pop back in the oven for a few minutes. Cover all the pieces. You’ll have some sauce left over, which you can serve on the side. Ta Da! Essentially, the teeny bit of water and the sauce coupled with the tight cover, braised the chicken so that it is tender and falling off the bones. It’s really a nice dish for sun-starved winter hibernators. Give it a whirl. Scott Peacock knows what he is talking about. Pat chicken pieces dry and season with salt and pepper. Set aside. Make sauce: Melt butter in Dutch oven. Add onions and cook until softened. Add the spices and the garlic. 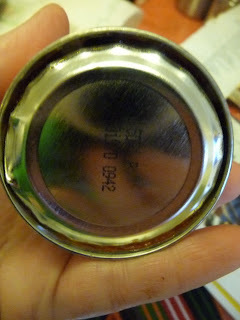 Cook another minute. 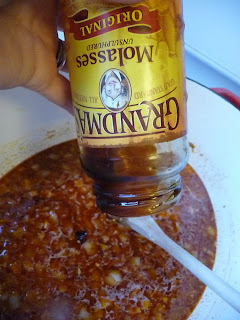 Add vinegar, Worcestershire, water and sugar. Bring to a simmer. Add the molasses, then whisk in the tomato paste. 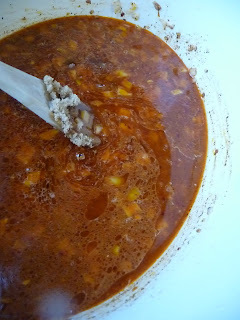 Bring back to a simmer, and cook, uncovered for about 15 minutes or until it's begun to thicken. Season with salt and pepper, if needed. 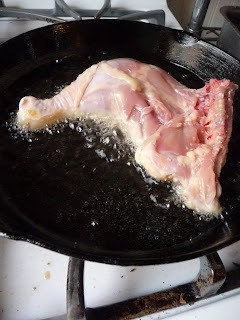 Start chicken: Heat about 1/4" of oil in a cast iron skillet. 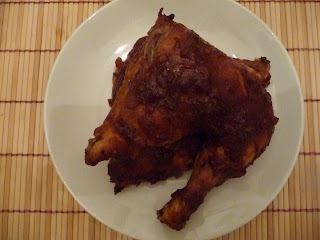 Fry chicken, skin-side down until browned. 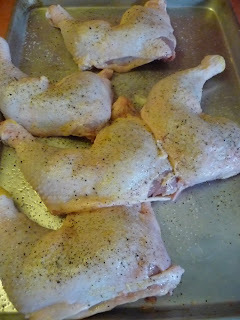 Place chicken pieces in an oven proof baking dish, such as a Pyrex. Add about a Tbsp of water to baking dish. Spoon some sauce over each chicken piece. 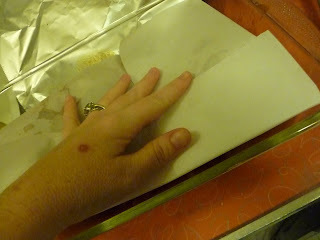 Cover the baking dish with a sheet of parchment. 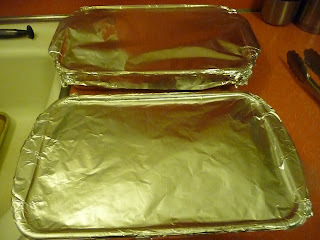 Cover the dish again with a sheet of aluminum foil, making sure that the dish is tightly covered. Bake for about an hour, or until your thermometer reads about 160*. 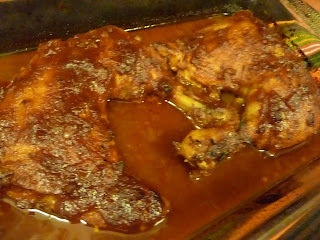 Brush a little more of the sauce on top of the chicken again and heat the oven to 450*. Place the chicken back in the oven, uncovered, for another 10 minutes.